On the morning of September 24, the pod was just starting to open. This week, that pod finally opened up, giving me the long-awaited chance to photograph some milkweed seeds within my plot. As it turns out, it’s a good thing I was vigilant, because that pod opened up and emptied itself out out very quickly. Within only a few days, the pod went from tightly closed to completely devoid of seeds. By the afternoon of the same day (24th) the pod had opened up much more, exposing the seeds, which were beginning to dry out and fluff up. The next day, September 25, the pod was wide open and seeds were beginning to fly out. I was traveling on the 26th, so didn’t get to check in on my plot. By the 27th, only three days after the pod opened, it was empty. Some of the seeds landed close by, but others flew much further away. While many of the seeds were blown well out of my little plot, a handful got stuck on adjacent plants, giving me the chance to photograph them. Here are some photos of those seeds as they were coming out of the pod or after they got hung up within the borders of my plot. As I walked a small prairie here in Aurora, Nebraska a few weeks ago, several species of milkweed were flowering abundantly, including butterfly milkweed (Ascelepias tuberosa), showy milkweed (Asclepias speciosa), and common milkweed (Asclepias syriaca). As always, the milkweed plants were hosting a number of specialist insects that feed on them. During my walk, the most plentiful of those insects was the large milkweed bug (Oncopeltus fasciatus). The large milkweed bug on butterfly milkweed – Lincoln Creek Prairies, Aurora, Nebraska. A view of the bug from the top. 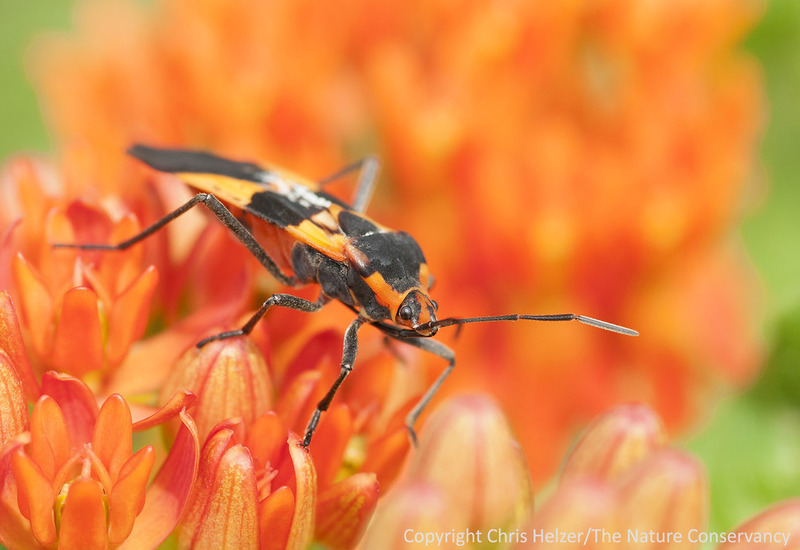 The large milkweed bug somewhat resembles a boxelder bug, but is considerably larger and has more orange color on its back. 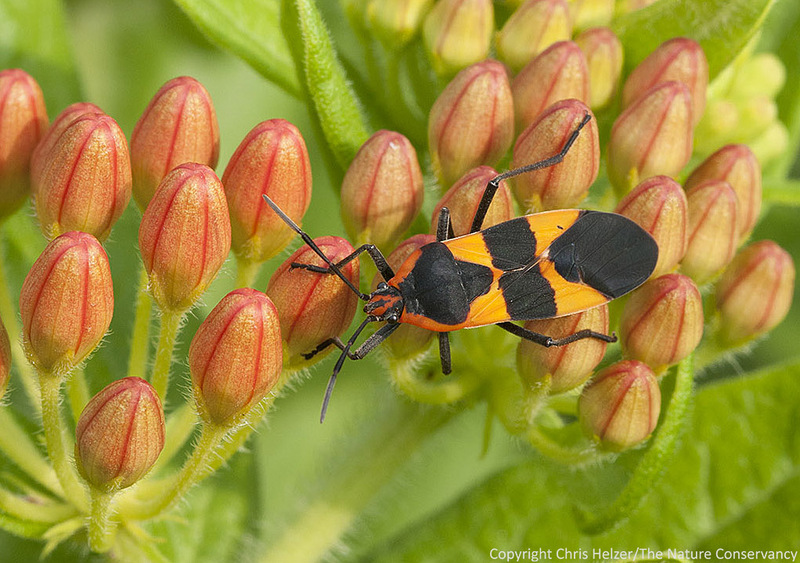 It is also larger (obviously) than the small milkweed bug, which looks somewhat similar but has two small white dots on its folded wings, as well as a different pattern of black and orange. 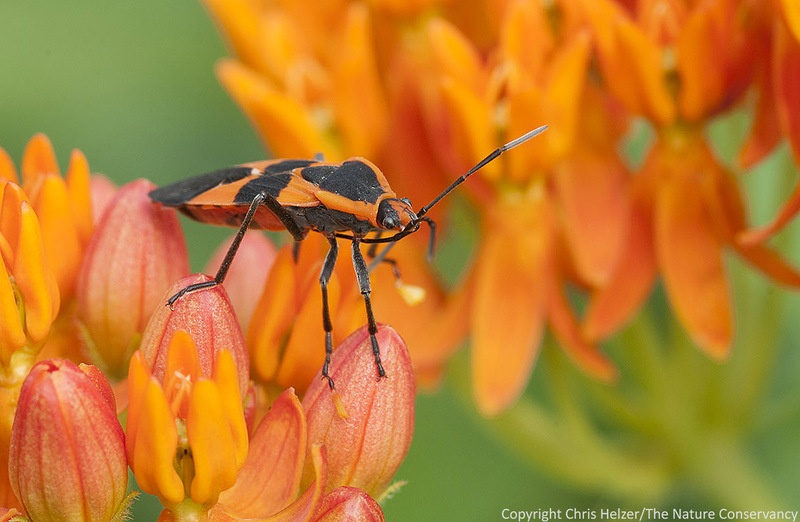 Like all Hemipterans (true bugs), the large milkweed bug feeds through a long piercing mouthpart called a rostrum. From the information I can find, the milkweed bug feeds on the seeds of milkweed, but will also feed on sap from the leaves and stems. Interestingly, I didn’t find any information about it feeding on the nectar of milkweeds, though that is certainly what it appeared many of the milkweed bugs I saws were doing. I watched several of them insert their rostrum into a flower and jiggle it up and down as if it were sucking the dregs of a milkshake through a straw. The photo below shows one with its rostrum inside the flower of a common milkweed. I’m guessing many entomologists have seen the behavior, but I didn’t find a reference to it. Butterfly milkweed wasn’t the only milkweed species with the bugs on board that day. This one is on a common milkweed flower and appeared to be feeding on nectar. About a year ago, I wrote a post about the arduous and complicated process of milkweed pollination, in which clusters of pollen called pollinia have to become attached to the leg of a visiting insect and then later detached in exactly the right place on a different flower. If you missed that post, it’s worth a read just to appreciate what seems like a nearly impossible process – though one that has obviously worked out just fine for many milkweed species. Several of the milkweed bugs I saw at the prairie a few weeks ago had multiple pollinia stuck to their legs, so apparently the bugs can be helpful to milkweed plants – in addition to being seed predators, nectar thieves, and sap suckers! 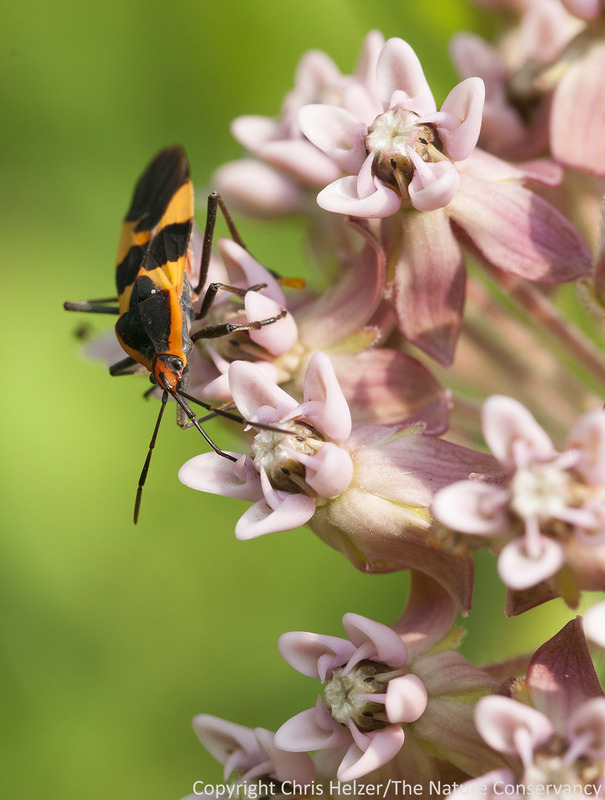 In this photo, you can see pollinia (sticky masses of pollen) stuck to two legs of this large milkweed bug. I visited this same prairie again about two weeks later with my son Daniel. Since he’s interested in insects, I figured he’d enjoy seeing all the milkweed bugs. The butterfly milkweed plants were still blooming profusely, but not a single milkweed bug could be found… Where did they go?? I guess it’s a good thing I took photos when I had the chance.